The original idea behind the study traces back to 1993 during the Mississippi and Missouri River floods, when Li’s advisor, WHOI senior scientist Ray Schmitt, noticed reports of abnormally low salinity in the Gulf of Mexico following the seven-month dousing of the region. “A lot of freshwater had to leave the ocean during that time to supply the extra rainfall on land, so some part of the ocean had to get saltier,” said Schmitt. Each year, an estimated 100,000 cubic miles of water evaporates from ocean surface waters – enough to flood our entire lower 48 states to a depth of 60 yards. About 90 percent of this moisture falls right back into the ocean as precipitation – a vast recycling of moisture that represents the bulk of the global water cycle. But about 10 percent of the evaporated water gets carried over land where it falls out as rain. 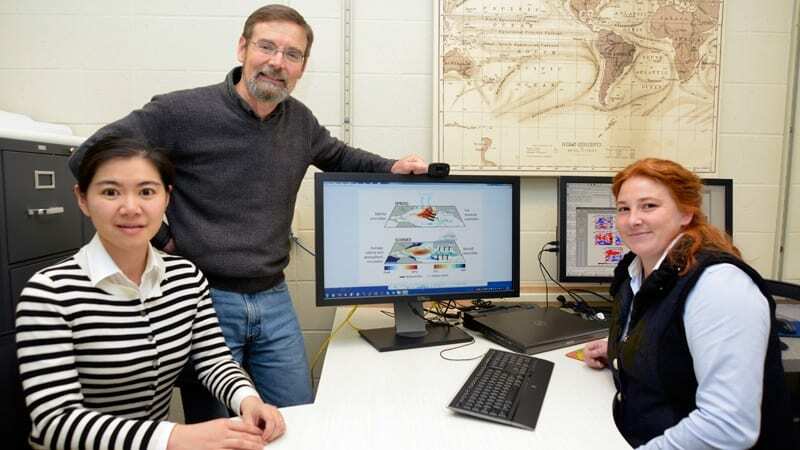 “This basic idea had me looking at the high-salinity areas of the ocean to see if the surface salinity variations could be used for rainfall predictions,” said Schmitt. In an attempt to use ocean salinity as a natural rain gauge, Li and WHOI co-authors Schmitt, Caroline Ummenhofer and Kris Karnauskas (now at the University of Colorado) poured through sixty years of global salinity and rainfall data, including detailed salinity maps generated by NASA’s salinity-sensing satellite, Aquarius. During a multi-year NASA mission that began in 2012 known as the Salinity Processes in the Upper Ocean Regional Study (SPURS), Aquarius helped identify a patch of the North Atlantic with the highest salt concentration anywhere in the open ocean. Schmitt and other colleagues then deployed moorings and autonomous ocean robots there to collect additional data on salinity levels. Later on, Li and Schmitt drew a box around the area and began looking at the historical salinity and rainfall data in hopes of answering the central question: where did all the fresh water go? But the cause-and-effect takes some time to develop – several months, in fact. 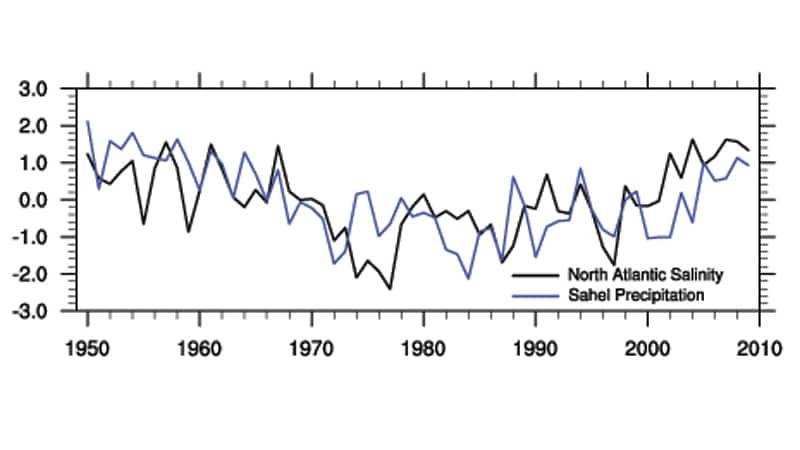 It turns out that while the subtropical North Atlantic had the saltiest anomalies in the spring, the Sahel was the wettest during summer monsoons. The three-month delay surprised the scientists. Upon closer analysis, they discovered that as moisture entered the Sahel, it turned to rainfall and gradually soaked the region’s bone-dry landscape throughout the spring. 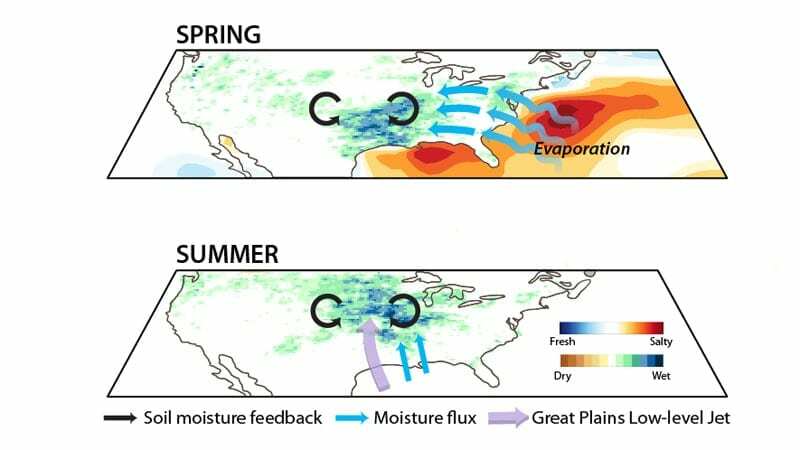 As moisture accumulated in the soil, the soil began pulling more energy from the sun and driving convection in the atmosphere, ultimately creating a feedback loop that drew in more moisture from the North Atlantic and Mediterranean. This resulted in increased rainfall when the summer monsoons hit. Tony Lee, a scientist and salinity expert with NASA’s Jet Propulsion Laboratory, agrees. He says that accurate prediction of seasonal rainfall is key to agricultural planning and the livelihoods of people in the Sahel region. “This study demonstrated that ocean salinity can be used to improve the skill of Sahel rainfall prediction, and underlined the values of the integrated observing system approach to address actionable Earth System Science questions that have important societal implications,” said Lee. Having successfully linked North Atlantic salinity with rainfall in the Sahel, the WHOI team has begun applying their techniques to other regions. They recently correlated high springtime salinity in the northwestern portion of the North Atlantic with summer rainfall in the U.S. Midwest, and have a “whole list of other places” they want to investigate. 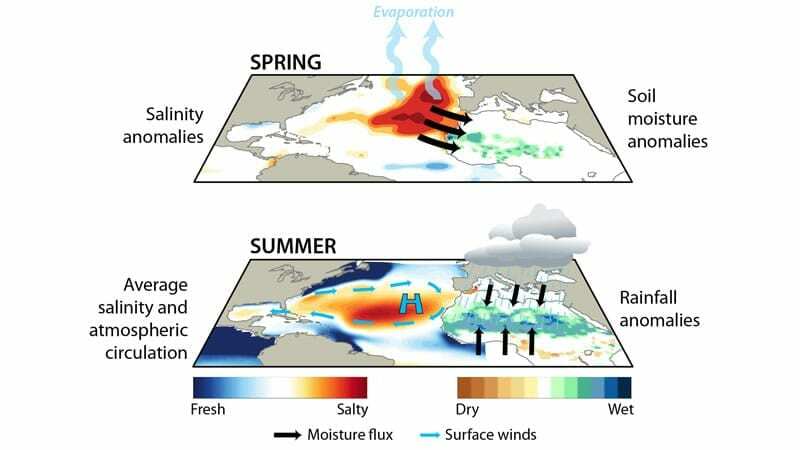 Top: Winds evaporate water from the subtropical North Atlantic ocean, leaving behind high levels of salinity during the spring. The exported moisture makes its way to the African Sahel, where it soaks the arid land and gradually builds up soil moisture over the course of three months. Bottom: The soil moisture couples with convection in the atmosphere to create a feedback loop that draws in additional moisture from the North Atlantic and Mediterranean. This increases precipitation during the summer African monsoon season. 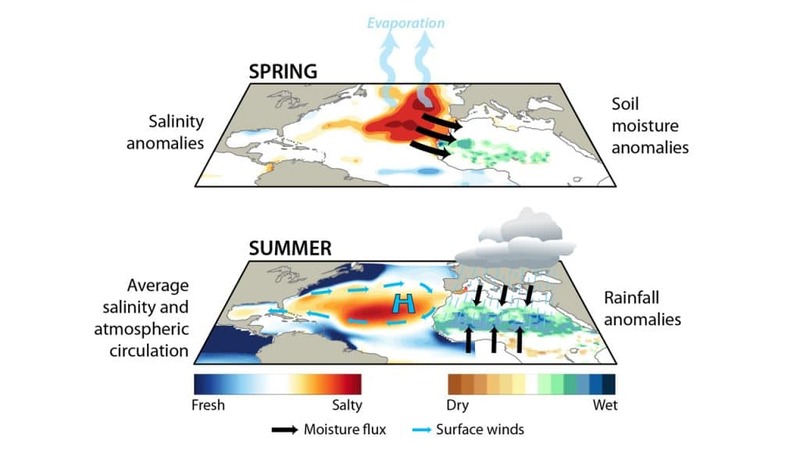 Top: In the western North Atlantic, higher springtime salinities are an indicator of enhanced moisture export onto the continental US which converges in the South. This greatly increases soil moisture there, allowing the Sun’s energy to evaporate water leading to more atmospheric convection on land.